One of the most important sectors currently determining the economic situation of countries, regions, including rural areas and enterprises is logistics. 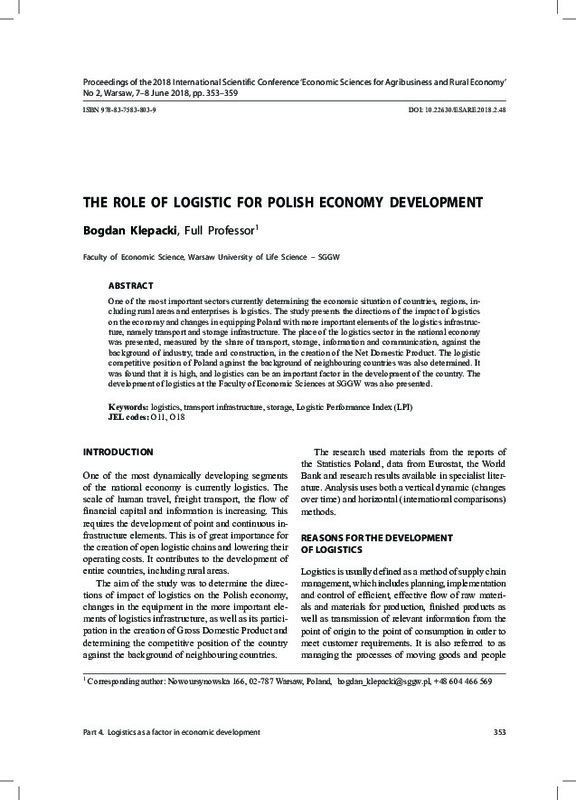 The study presents the directions of the impact of logistics on the economy and changes in equipping Poland with more important elements of the logistics infrastructure, namely transport and storage infrastructure. The place of the logistics sector in the national economy was presented, measured by the share of transport, storage, information and communication, against the background of industry, trade and construction, in the creation of the Net Domestic Product. The logistic competitive position of Poland against the background of neighbouring countries was also determined. It was found that it is high, and logistics can be an important factor in the development of the country. The development of logistics at the Faculty of Economic Sciences at SGGW was also presented.